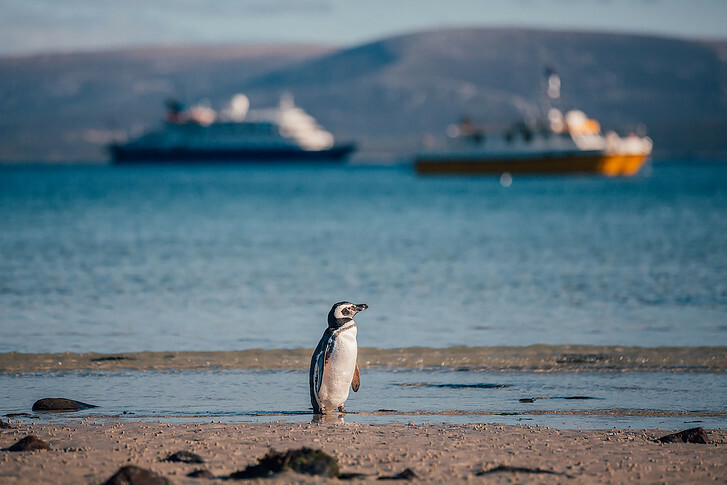 5 Penguins You'll Find in the Falklands - The Penguin Capital of the World! In my last post I mentioned that the Falkland Islands can be a bit difficult to get to. While you won’t find many people in and around the islands, one thing you’re almost guaranteed to see are penguins! The Falklands, thanks to their remoteness, are home to more penguins than people. 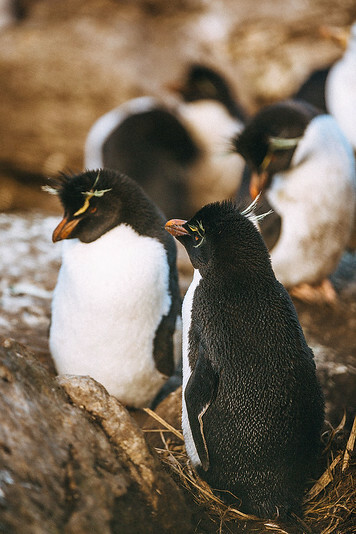 Today I’m sharing all about our adorable penguin encounters, the types of penguin species on the island and of course, the best places to find them! How many penguins live on the Falkland Islands? More than a million penguins call the Falklands home. 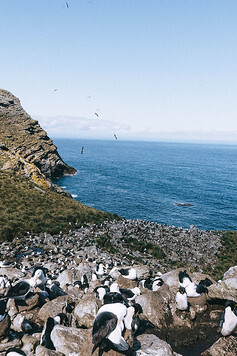 The birds love the beaches, craggy cliffs and tussock grass that dot East and West Falkand. 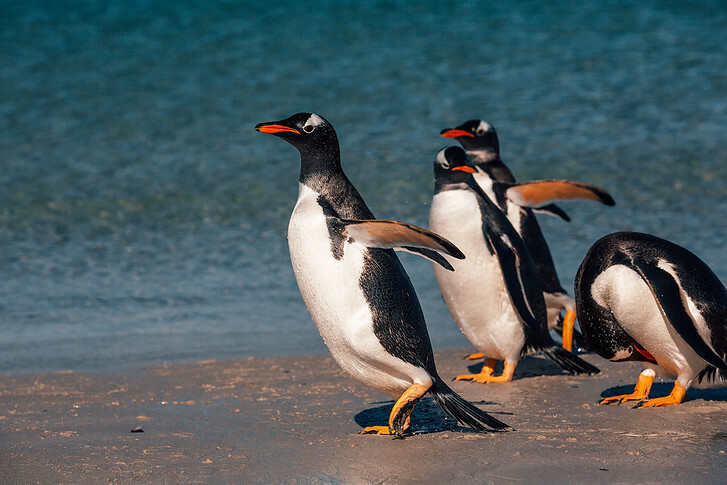 So, break out into a happy dance – you’re almost guaranteed to see penguins when you visit the Falklands! What Penguins are in the Falklands? Can you believe that’s more than you can find in Antarctica, which is home to just 4 species?! Two species (Gentoo and King) live in the Falklands year round. The remaining three species are more seasonal guests, who migrate all over the region to South Georgia, Antarctica and the South American coast. There are so many penguins that it’s not hard to come into contact with them. But, most live on huge sheep farms that are privately owned. If you call ahead and ask, locals are typically kind enough to let you take a look. 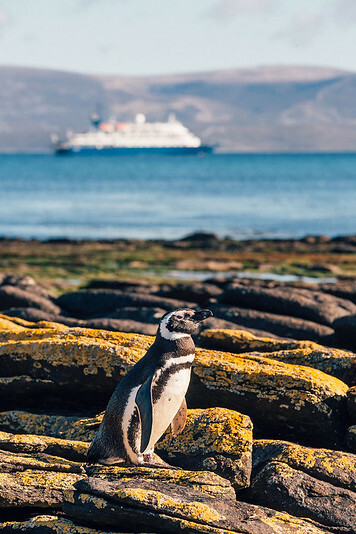 What’s easier though, is to join a cruise in the Falklands, as cruise operators have arrangements with local farmers to guide visitors directly to the penguin colonies. This is how we visited West Point on our trip to the Falklands. Here’s a look at each of the different penguin species: what they look like, how they act, and where to spot them! Rockhoppers are tiny, quirky looking penguins with a crest of spiky yellow feathers poking out on each side of their heads. That, with their beady red eyes, gives them a bit of a crazy Einstein look! These funny looking penguins were named because of their habit of hopping from rock to rock. They nimbly hop over jagged peaks and cliffs…with both pink feet together! Rockhoppers are quite small, usually no more than 20 inches as full grown adults. Scientists can’t distinguish male and female rockhoppers just by looking at them – they actually need to do a DNA test to distinguish between the sexes. 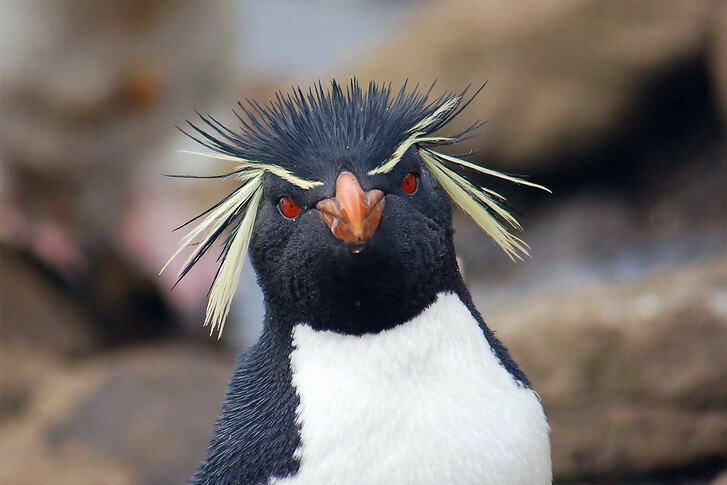 There are actually a couple different subspecies of rockhopper penguins. 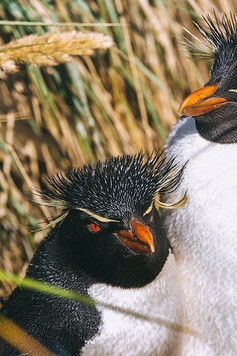 The kind that visit the Falklands are typically classified as the Southern Rockhopper Penguin. Where to Find Rockhoppers in the Falkland Islands? There are over 300,000 breeding pairs of Rockhopper penguins that migrate to the Falklands each year. They love cliff side nests, so you’ll often find them perched on tall cliffs near the water’s edge. Each pair will lay 2 eggs. Scientists aren’t sure why, but the second egg is typically larger than the first. 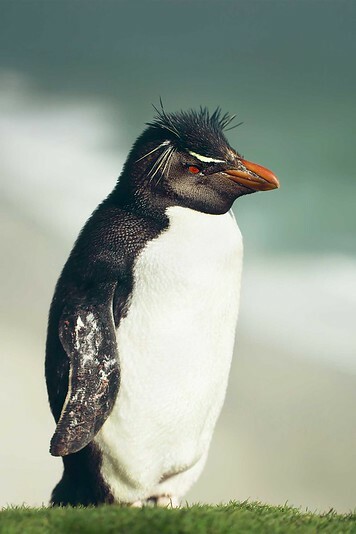 Rockhopper penguins are migratory and return to the Falklands each year in the summer. They arrive in October to mate and breed, departing around April once their chicks are able to feed for themselves. The Falkland Islands are home to the largest population of Gentoo penguins in the world. Gentoos are a very classic looking penguin. They have bright orange beaks and a white bonnet like stripe that goes from eye to eye on the top of the head. Gentoos are medium sized, roughly 20 to 35 inches tall and great swimmers. They’re the fastest underwater penguins and can reach speeds of up to 22 miles per hour! Where to Find Gentoos in the Falkland Islands? 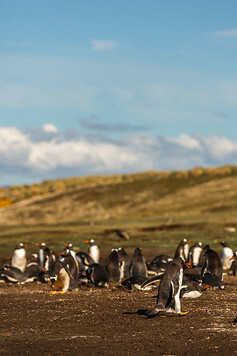 Over 120,000 pairs of Gentoo penguins call the Falklands home. With so many, you can spot this penguin species almost everywhere on East and West Falkland. Gentoos love to nest near sandy beaches so keep an eye out on the shoreline. A group will often smoothly ride the waves and then stumble awkwardly on the beach! 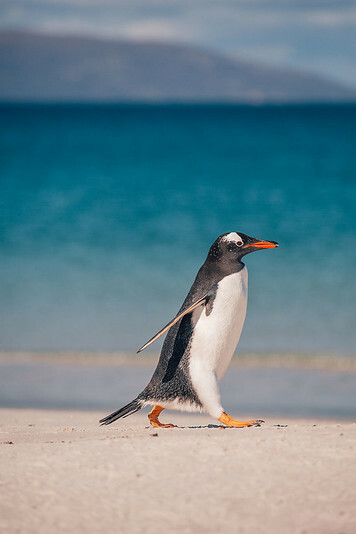 Gentoo penguins are really cute and will often waddle together in single file from the sea to their nests. Gentoos are endemic to the Falkland Islands and you can find colonies pretty much all over, all year round. Sometimes, you’ll even see just a couple Gentoo penguins among other animal colonies. Chicks hatch around mid November. Magellanic penguins are entirely black and white, with thin border-like bands of black around their neck and torso, for a slight zebra-esque effect. They also have white patches on the head from eye to eye and black feet. Magellanic penguins grow to between 24 to 30 inches tall and weigh anywhere from 6 to 14 pounds. 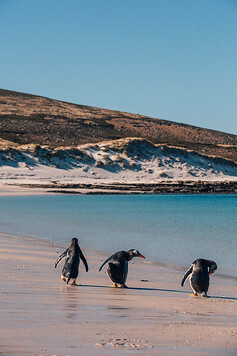 They’re native to South America, and their strong swimming skills enable them to migrate between the nutrient rich Patagonia Shelf and their breeding grounds across Chile, the Falklands and Brazil. Where to Find Magellanic Penguins in the Falkland Islands? Magellanic penguins were discovered as early as 1520! They’re named after their discoverer, Portuguese explorer Ferdinand Magellan. Magellanic penguins can be found all over the Falklands. They love to dig burrows in tussock grass so if you see hundreds of holes in the ground, chances are you’ve found their nests! Stay patient (these birds are shy) and you’ll be rewarded with a Magellanic peeking its head out! Magellanic penguins feed in flocks and return to the Falkland Islands each summer to breed. The males arrive first, seeking out their old nests and patiently wait for the same partner. We spotted Magellanic penguins hiding around Gypsy Cove as well as on Carcass Island. King penguins are the largest and most beautiful penguins to be found on the Falklands. They can stand up to 39 inches tall, making them the second tallest penguin species in the world. These birds stand regally upright and often stretch their necks tall. They look like distinguished elder statesmen compared to other penguins and walk a bit more elegantly! 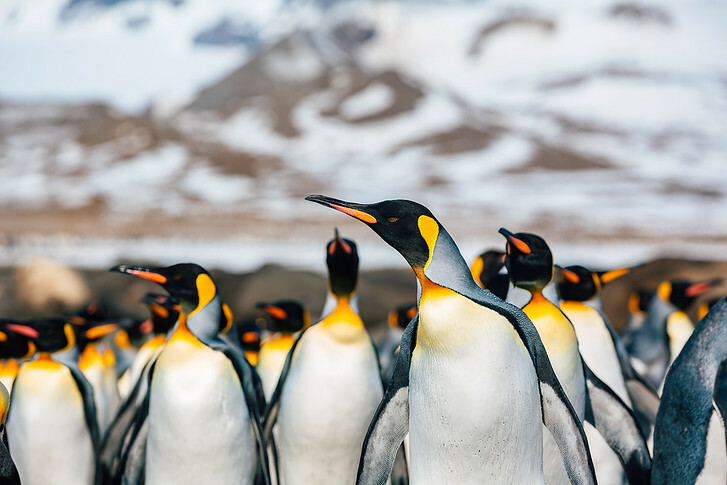 King penguins are closely related to Emperor penguins and both species look similar. If they were side by side, it might be hard to distinguish between them, but luckily King and Emperor penguins don’t inhabit the same areas! King penguins are thinner, with larger flippers relative to their size than Emperors. 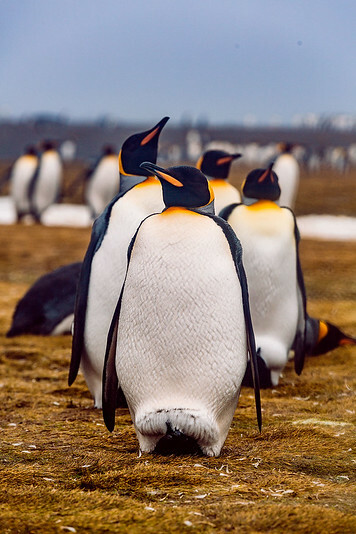 While both species have colorful patches near the lower jaw, on King penguins the patch tends to be orange while on Emperor penguins, the cheek patch is more pink. Where to Find King Penguins in the Falkland Islands? 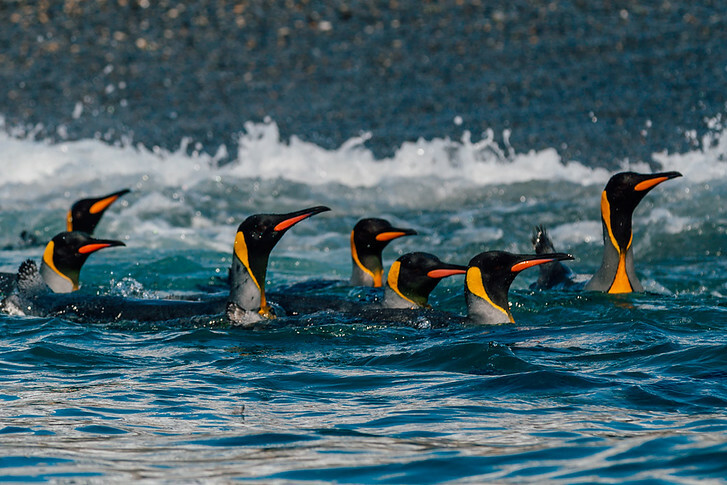 King penguins like to congregate in large colonies. Unlike most penguin species, their young look nothing like them! In fact, early scientists thought King penguin chicks were an entirely different species, as they look fat, fluffy and brown. There is a large King penguin colony at Volunteer Point, a privately owned farm about 2 hours drive from Stanley. You’ll need a four wheel drive to reach it, or access via an expedition cruise. 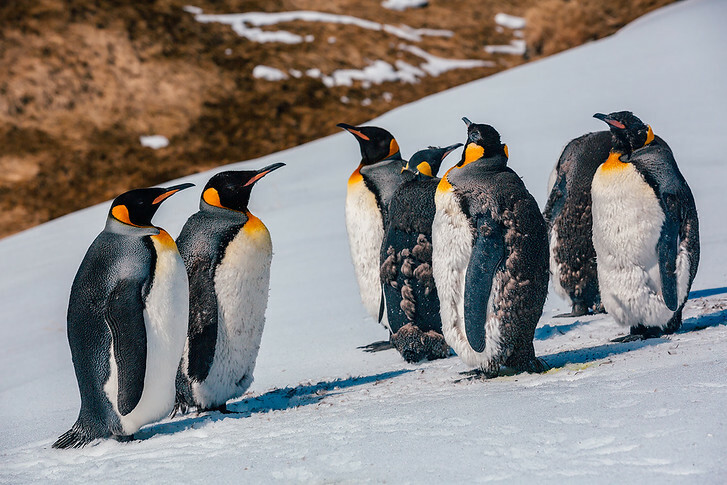 King penguins have a very long breeding and chick rearing cycle, so you can usually spot both adults and chicks at any time throughout the year. King penguins start to breed around 5 or 6 years old and have a very unique life cycle compared to the other penguin species. First, they’re serially monogamous, meaning they have one mate each year that they’re faithful to… but they don’t necessarily remain with the same mate each year. While most penguin species raise a chick or two each year, King penguins usually are only successful one year in two. They’ll incubate the eggs on their feet and time their breeding so chicks are born in harsh winter (the opposite of most species, who hatch and rear their chicks quickly in just one summer season). King penguin chicks take 14 to 16 months to grow to size. The chicks are fat, fluffy and brown and essentially rely on their fat stores to last the winter. By the time they’re one year old, they group together in a creche, looked after by just a few adults, while their parents have more freedom to return to the sea to feed. Macaroni penguins are a medium size, crested penguin. They look similar to Rockhopper penguins, so it can be difficult to tell them apart. Macaronis are slightly larger, with orange head feathers instead of yellow. With that being said, they get along with their cousins as Macaronis and Rockhoppers are known to inter breed! Macaroni penguins got their name from the term maccaronism, a flamboyant style of dress that was popular in 18th century England. Men who dressed excessively were called ‘maccaroni’ and apparently scientists through these birds looked a bit ridiculous too! 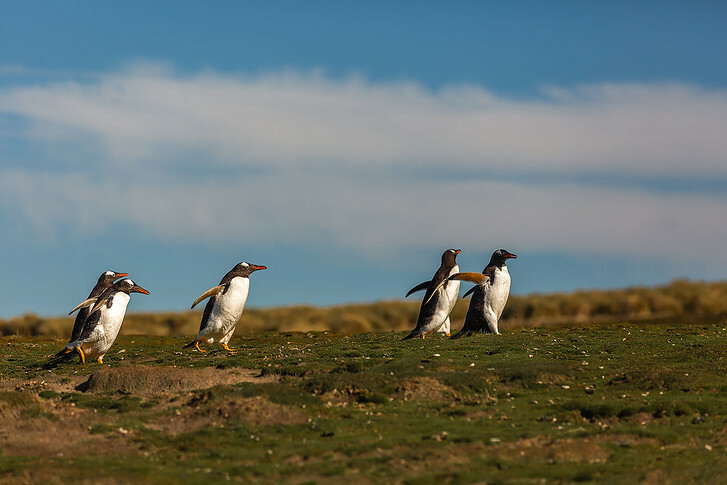 Where to Find Macaroni Penguins in the Falkland Islands? 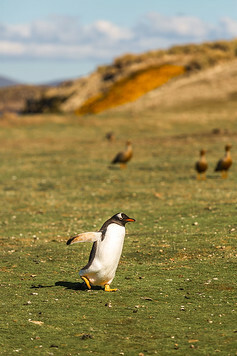 It’s pretty rare to spot Macaroni penguins in the Falklands as they prefer to breed on nearby South Georgia. But, we managed to see a large colony at West Point! These plump, unibrowed penguins were calmly mixed among nesting albatross birds on a steep cliff by the sea. 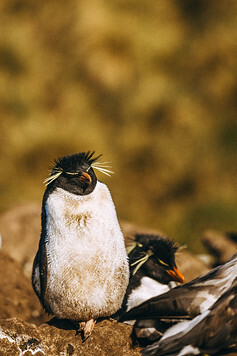 Macaroni penguins, like their closely related Rockhopper cousins, come to the Falklands to breed. They arrive to the Falklands in October and depart by April. Antarctica Vlog: Watch a day at sea on board the Sea Spirit! Don’t forget to subscribe on Youtube for more videos. Which penguin species is your favorite? Thanks for sharing with us about the penguins. Never thought that there were that many species & that some species are migratory. My favorite is the king penguin. And the pictures are very vivid & beautiful. These creatures are so pretty! It is sad to know that they are threatened by human interaction (climate change). Ironically, the more people travel to see the penguins, the faster they, and other creatures, will die out. Do not take this as criticism though: you have a fantastic blog – and your pictures of these penguins are just adorable. Hi Amund, thanks for stopping by. Yes, it’s unfortunate how much climate change is affecting the world. For visits to Antarctica, if you cruise with an IAATO category 1 expedition ship, it is one of the most environmentally friendly ways to visit. 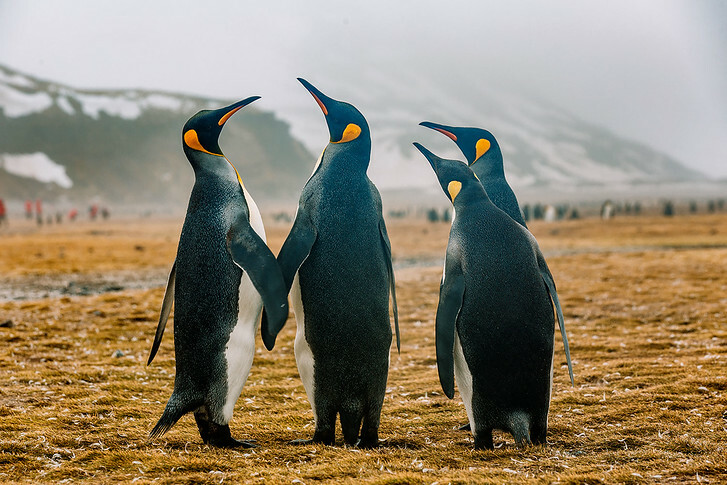 They adhere to strict standards to respect both the Antarctic environment and wildlife (for example, blackout curtains at night, minimum distances for viewing, limited numbers of people on shore per landing, as just a few ways). South Georgia in also a great example of a country that uses its tourism dollars for good. They are VERY strict on biosecurity when you visit, to protect the local wildlife, and they charge very high landing fees that go back to helping the local conservation efforts.